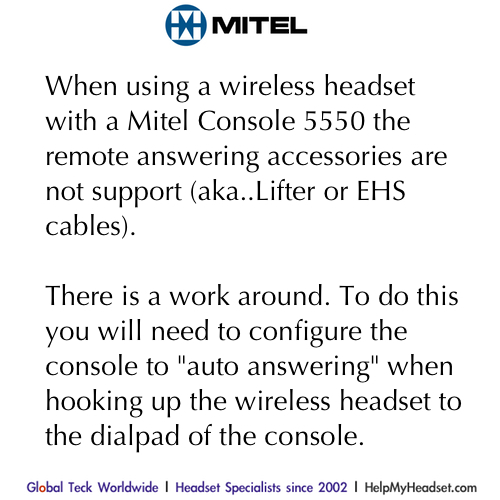 These wireless headsets in this section are designed to work with your Mitel telephone and are proven to provide excellent sound quality regardles of work environment. Superconsole 1000, Superconsole 2000, 3DN, SuperSet I, II, 3, 4, 4DN, 7, 410,420, 430, 4001, 4015, 4025, 4125, 4150, SuperSet 700 (PC Phone), SuperSet 7000 (PC-Attendant). Mitel IP Unified Communications - Navigator softphones - PC - Smartphones click here. 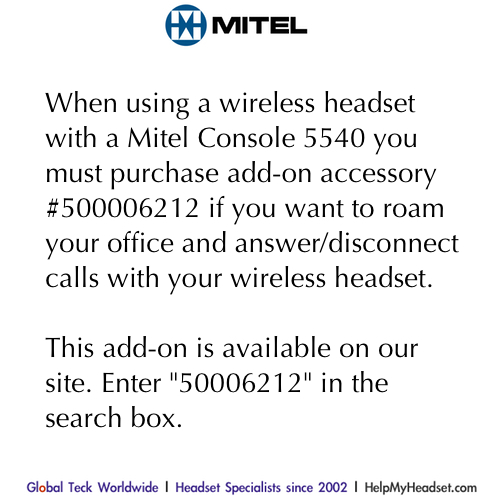 If don't see your phone model or not sure which Mitel headset is compatible with your Mitel phone contact us via chat, email or call us 703-766-6363 so we can provide you with details for the most suitable headset for your environment.